Shravan purnima’s second festival is Raksha Bandhan. This is an ancient tradition. Bhavishya Purana refers to a battle between gods and demons, and Indra (the king of the gods) was feeling depressed. At that time Indra’s wife Sachi took a thread, charged it with sacred verses or Mantras for protection and tied it on Indra’s hand. Through the strength of this thread Indra conquered his enemies. Since then till today this festival is celebrated. Through the passage of time festivals are undergoing modifications. 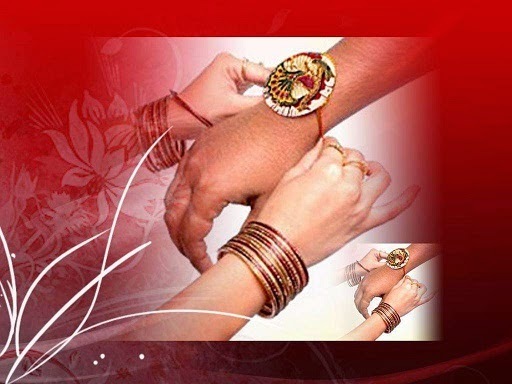 Raksha Bandhan is also known as Rakhi. Rakhi has become a sacred festival for sisters and brothers. Sisters tie them to brothers. Priests tie them to people of his congregation. During the middle ages, if a woman tied a Rakhi on the hand of any man, then it became imperative for him, as his religious duty of the highest order, to protect that woman. That man would put his life at stake to protect the honour of that woman. In those days, many Rajputs sacrificed their lives to protect their spiritual sisters. Humayun received a Rakhi from the queen Karmavati of Chittor and for that, Humayun carried out his sacred brotherly duty and protected her by opposing his own soldiers. Nowadays Rakhis are decorated with soft silky threads of various colours, and also with ornaments, pictures, gold and silver threads etc. These Rakhis enhance the artistry of the people. Within these Rakhis reside sacred feelings and well wishes. It is also a great sacred verse of unity. Acting as a symbol of life’s advancement and a leading messenger of togetherness. Each person should celebrate with enthusiasm this sacred festival of Rakhi or Raksha Bandhan. Raksha Bandhan is celebrated on the full moon day of Shravan (also known as Sawan) every year; that is why it is also known as Rakhi Purnima. It is the day to celebrate the brother-sister love. Sister ties the Rakhi on brother’s wrist wishing him a prosperous life and brother pledges to protect his sister. The day is also known as Rakhri in some regions. It is one of the main festivals of India. 1. If Bhadra falls in the Aparahan Kaal on Purnima, Raksha Bandhan rituals cannot be performed in this duration. In such case, if on the next day, Purnima is prevailing in the first 3 Muhurats of the day, the rituals can be performed in the Aparahankaal of the second day. It is because at that time, Sakalyapadit Purnima will exist. 2. If Purnima is not prevailing in the first 3 Muhurats of the next day, Sakalyapadit Purnima will also not exist. In such situation, Rakshabandhan can be celebrated on the first day after Bhadra in the latter half of Pradosh. Aparahankaal is not considered important at many places like Punjab. Hence, they celebrate the festival before Madhyahn, i.e. usually during early morning. But, our scriptures completely prohibit Raksha Bandhan celebrations during Bhadra, no matter what the situation is.